On one side of this cat place mat an orange and white cat looks up at you. 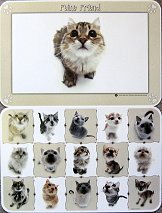 On the reverse side there are fifteen cats looking up at you. This vinyl place mat is 17 1/8" wide x 11 1/4" high. Made with recycled material in the USA. Wipes clean.